Time to Shine! 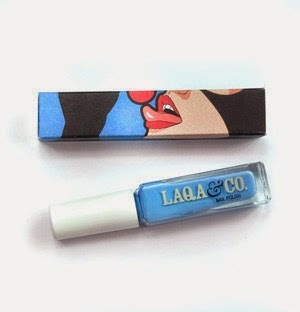 LAQA & Co. Nail Polishes (Tweedledee, New Fangled, Bounty Hunter) Review + SWATCHES! When it comes to a gorgeous range of nail polish shades, you can always count on LAQA & Co. to deliver some stunning looks for fingers and toes. This month I received three spectacular colors that can help you set the summer scene on fire. Tweedledee ($13) is a bright, eye popping coral-pink color that covers well with just one coat. Just as stunning is the artwork of the box by artist, Paul Price. I am partial to Tweedledee. The shade looks good with practically everything. New Fangled ($11) is a reflection of a beautiful sky blue. Wearing this one can add that finishing touch to set off a particular outfit. The artist behind the equally attractive box is Grégoire Guillemin. Here is the edgier shade of New Fangled. Bounty Hunter ($13) is a trendy, bold fuchsia. This color definitely grabs attention. Give yourself a pedi and sport this shade with your sandals to steal the show. The artwork featured on the box is by Charles Wilken. Bounty Hunter is great for flirting with your hands. 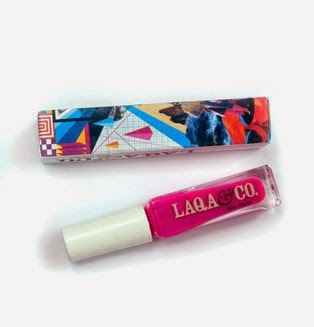 There is a lot to like about LAQA & Co. Let me start with the polish first. They provide a nice brush that helps you apply the product as evenly as possible. Also, their formulas wear well without needing to run to redo in a day or two. Equally impressive is the company gives a small portion of the sale back to the upcoming artist that designed the box to help them benefit financially as well as get public recognition in their field. Kudos, LAQA & Co.! I highly recommend checking out LAQA & Co. You’ll love their wonderful collection because whatever your style or personality dictates, and they have shades to reflect it! Next Post The Secrets of Beer Beauty 101!